If you’re reading Serious Eats now, it’s because people like you believed in Serious Eats when we first started out. You might not believe the things we had to overcome to get here, but I’ve written a book about it all. It's called Serious Eater: A Food Lover's Perilous Quest for Pizza and Redemption. Want proof? That’s the cover right up there. You might notice I'm on the cover. That wasn't my idea, but somehow now I think it works. As everything having to do with this site always has been, Serious Eater was truly a team effort. Kenji wrote a beautiful foreword, and both he and Stella contributed some original recipes to the book. Countless other Serious Eaters past and present read drafts, masterminded the launch, and provided good food and good advice. The book's publication date is June 11, but you can preorder it online now. Why do that? Because then you'll get your hands on it before anyone else—along with some sweet rewards, for which you’ll just have to stay tuned. And keep your eyes peeled for more to come, especially events in Los Angeles, San Francisco, Portland, Seattle, and New York—including a special event at Kenji’s Wursthall. Why did I write the book? I wanted—I needed— to make sense of the insane 10-year-long roller-coaster ride that was founding and growing Serious Eats into an established website. (It was a terrifying ride, but one that only whetted my appetite to find the next great slice of pizza.) I wanted people to see what happens when a food journalist tries to turn his pursuit of food pleasure into a business in the go-go years of the blogosphere, when anything and everything seemed possible. It's a helluva yarn—so unbelievable that it could only be true. You'll learn about my pre–Serious Eats life, including the many years I spent in the music business working with the likes of Wynton Marsalis, the B-52s, and Dr. John. You’ll read about how the original Serious Eats crew came together, including our first chief technology officer, Tumblr founder David Karp, and how we almost teamed up with the founders of Bonnaroo to go into the live food events business in a major way. You’ll hear the story of how Kenji and I fell into our incredible creative partnership and how so many Serious Eaters, past and present, have helped shape this glorious site (many beloved Serious Eaters make appearances, including Robyn Lee, Adam Kuban, and Max Falkowitz). You'll learn the desperate, almost absurd lengths I went to keep Serious Eats alive, risking just about everything I hold dear. And finally, you’ll learn about the crucial supportive roles my wife Vicky and my late brother Mike played in the drama that was Serious Eats. In short, you'll learn the unvarnished truth of the whole Serious Eats saga. So if you want to read about the miracle that is Serious Eats, I don't think you'll be disappointed. 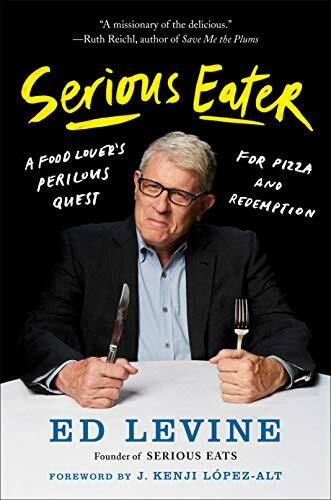 But I have to warn you: Serious Eater will make you extremely hungry.